Pilgrims from all over the country come to visit the relics of Saint Matrona in Pokrovsky monastery, which is located on the street Tagansky, and the tomb on the Danilovsky cemetery. Drive to Mother Matron, with metro, tram and car. Daily Holy Matron asking for thousands of people. Many not only pray in front of icons, but also come to the relics and the tomb of the Saint. Believers say that the Matron Mother herself will show the way to those who need it. The relics of Matrona of Moscow is located in the Pokrovsky monastery, in the left chapel of the intercession Church. For pilgrims a visit: from 7 to 20 hours, Sunday 6 o'clock in the morning. At Easter and 2 may (memorial day Matron) pilgrims are allowed round the clock access. 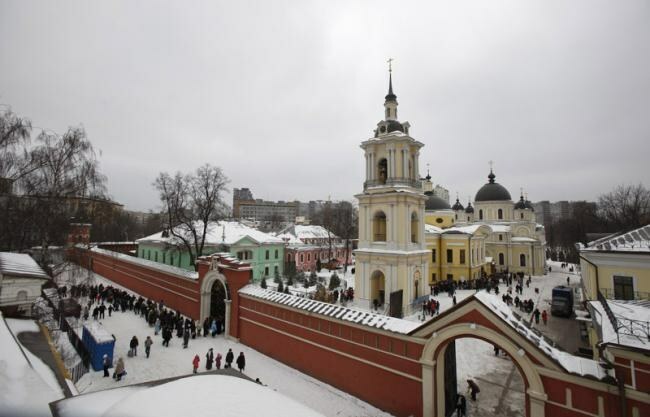 The monastery is located at the address: Moscow, Taganskaya str., D. 58, at the intersection of three major streets of Moscow: Nizhny Novgorod, Taganka Rogozhskaya and shaft. The monastery can be reached by public transport and car. You can take the subway and get off at the station Marxist, Taganskaya walk the streets and go to Abelmanovskaya gate by bus No. 51 or trolleybus № 16, 26, 63. Also the metro station Ryazan prospectus and on the street Papernika catch a minibus or 63 463, trolley bus 63, or bus 51. If you go to the station Lenin Square, the further you can get to the bus stop Abelmanovskaya Outpost. Coming to a stop Abelmanovskaya Outpost, you need to pay attention to the people that go with flowers. They can not be overlooked, they are all from different metro stations sent for help to the Holy matron. Matrona of Moscow was buried on the Danilovsky cemetery, which can be reached in three ways: by car, metro station Tulskaya and the tram number 26 from metro Shabolovskaya. Those traveling by car need to get to the Small Tula street, turn on the duhovsky lane and, without turning anywhere, drive to the yellow gate of the cemetery. Find a grave Matron is simple: immediately after the entrance to the cemetery stands a small building, for him to turn right after 10 metres you will see the pointer "to the matron," to follow him (walk about 5-6 m). The tomb resembles a small crypt, it is protected, and near it always there is a woman that this place cares and gives to everyone who came to the Holy matron, sand. It helps to find happiness and harmony, relieves pain and strengthens faith in God. To visit the relics of Saint Matrona better on weekdays, weekends turn over several times, can stand up to 6 hours. If you are bringing a child, you can pass the queue to the big icon and the relics. Going to the grave to the Holy matron, not necessarily in advance to buy flowers. In front of the entrance to the cemetery is a large flower shop.